Orthodontics can give you that straight smile you’ve always wanted however, you have to step up your dental home care. With poor home care you may get your braces off, and although your teeth may be straight, they may have areas of decalcification, which can show up as discolored areas on your teeth, as well as cavities. 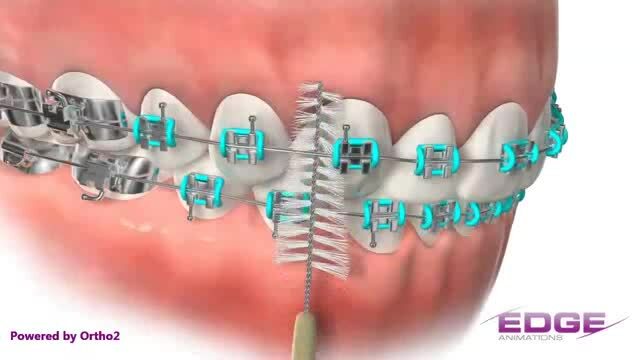 Having braces is a great way to become more confident in your smile but you will have a lot more areas to clean which means more time and effort on your part. Here are a few tips on how you can make sure your smile looks great after your braces come off. These nifty devices help you get the floss between your brackets. (see,it’s not just for stringing popcorn during the holidays.) Also, Super floss makes it even easier by taking out a step. You don’t even have to string the floss. It’s built in. Wow, how convenient, I bet you want to floss several times a day now. They have these in travel size as well so that you can keep them in your bookbag, purse, car, etc. This way, after you eat, you can remove food debris from around your brackets easier. Which is good for you and the people you are smiling at after lunch. Have longer bristles to help clean around brackets and wires. I highly recommend these toothbrush for anyone, not just people in braces. The Oral-B can be purchased at our office for your convenience. Can get into smaller spaces easier, especially if you have a smaller mouth. Although fluoride will not prevent decay it is a great adjunct to your daily routine. If you or someone you know has braces, you know how difficult they can be to keep clean. There are more places for bacteria to hide and tartar to grow. Your hygienist and dentist may suggest you come in every 3 or 4 months while in braces to help with your oral hygiene. Please watch the Orthodontic Brushing video by clicking this link for more information. Not all of these dental products need to be used. Talk with your dental team and see which would be best for you. If you have any questions please visit our website at raleighncdentistry.com on various ways to contact our office.